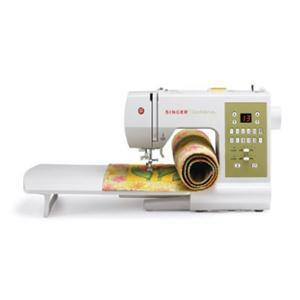 The SINGER 7469Q Confidence Quilter machine has many advanced features including the Drop and Sew ? bobbin system, programmable needle up/down, drop feed, twin needle capability and push-button stitch selection so sewing and quilting is enjoyable. The 7469Q boasts 98 stitch patterns and standard accessories including popular quilting presser feet. "Included Accessories: General/All Purpose Foot, Zipper Foot, Satin Stitch Foot, Blind Hem Foot, Buttonhole Foot, Even Feed/Walking Foot, Darning & Embroidery/Stippling Foot, Open Toe Foot, Straight Stitch Foot, Needles, Bobbins (4), Auxiliary Spool Pin, Felt Discs (2), Spool Caps (3), Seam Ripper/Brush, Screwdriver, Extension Table, Foot Pedal, Power Cord, Instruction Manual "